One of my favorite purchases last year was our bar cart. It obviously serves it's purpose in our home, but it's also something else I can decorate for each season. 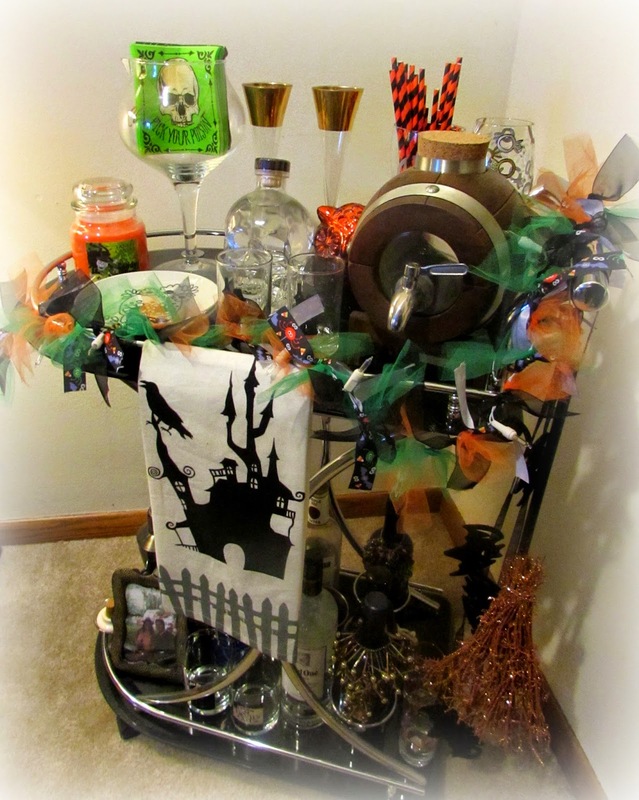 I had such a fun time putting together a Halloween theme and wanted to share some great finds you can use in your home even if you don't have a bar cart. One of my favorite pieces is the festive garland with lights from Luce Accents on Etsy. I have a few pieces from their shop for different seasons and love them all. Marshall's is a great place for fab finds on a budget. I purchased the bar towel, festive owl, candy corn candle and napkins for a steal under $22 total. The broom and bat garland hanging on the side are dollar bin goodies from Target. The straws are also from there. The most expensive pieces, but still relatively cheap, were the plates and glasses from Crate and Barrel. $4 for the plates and $3.50 for the glasses. The glasses are now on sale already. 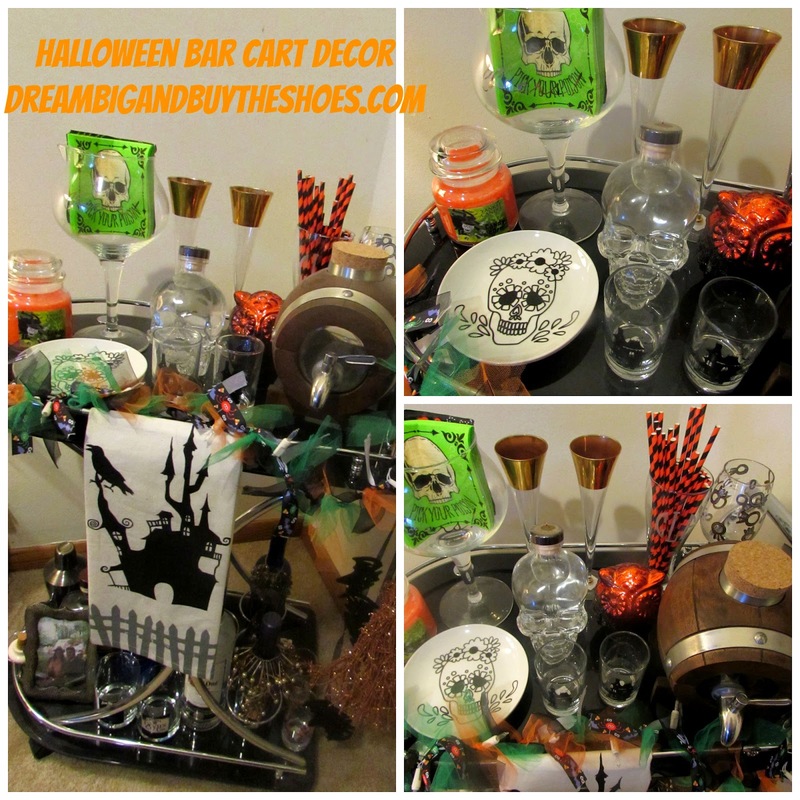 I am obsessed with decorating our bar cart and making it fun for any guests we have. I am also on the lookout for good finds on sale after the holiday is over. Stay tuned next week for an amazing fall drink you can make this season. Tell me...what's your favorite place to find seasonal decorations? Wow, love how festive this looks!! Wow, that's probably the most festive bar cart I've seen! I love it! Looks fabulous! I love how Halloweeny it is! As I've raved before, I love Pier 1 and they never disappoint with holiday treasures! Happy Halloween! Thanks E! Glad you got to see it in person! I need to find a few Thanksgiving cart items & will have to check out Pier 1! Thank you so much :) XO! I'm Emelia! I love writing and and think that you're never too young or too old to Dream. So I'm keeping my dream alive by sharing some fun things in life with you. I love cupcakes, pretty skies and coffee- lots of coffee. Grab a cup and join me in this crazy, wonderful life!